In situ ("in place") remediation refers to the cleanup of contaminated soils and groundwater without removing contaminated media from the subsurface, typically through the use of physical and/or chemical processes. Advantage Probe & Injection Corp performs injection of in-situ remediation chemicals and reagents including oxidants and oxygen-releasing compounds using high-pressure injection pumps systems coupled with our direct-push probe equipment. Large volumes of remediation chemical individual injection wells or multiple injection wells networked through manifold piping. With the rising interest of in-situ remediation techniques, Advantage Probe & Injection Corp has become a leader in the application of bioremediation and injection materials. No matter what size your job is or the material you are trying to inject into the ground, we have the equipment and temperature needs for a variety of remediation compounds. Mixing equipment and injection pumps. ORC (Oxygen Releasing Compound) and HRC (Hydrogen Releasing Compound) are products manufactured by Regenesis for in situ treatment of groundwater contamination, and have been used due to proven performance, time-release properties (up to a year of treatment from a single application), ease of handling, and cost effectiveness. ORC - provides a time-release application of oxygen into groundwater to enhance the activity of aerobic bacteria and degrade the majority of hydrocarbons including vinyl chloride, BTEX, diesel range and mineral oils dissolved in groundwater. The GS2000 Injection Pump is a standalone hydraulically-driven dual piston pump. Originally designed to pump high viscosity materials such as HRC®, the GS2000 can deliver grouts or remediation fluids at a rate of 3.6 GPM with pressures up to 1,800 PSI. The power plant behind this pump is a manual start 9 HP Honda gasoline engine. It features a hydraulic cooler for longer pumping intervals, such as when pumping permanganates, and a battery for a reliable electrical system. Dual pistons on this pump provide a nearly constant flow of material. The pump components are constructed of stainless steel and nitrided steel to resist corrosion from everyday use and harsh chemicals. The piston pumps can be totally disassembled, cleaned, and reassembled in less than 5 minutes. 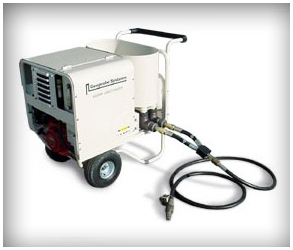 Although the GP300 was originally designed to pump HRC®, it is certainly not limited to pumping the most abrasive grouts and the most caustic remediation fluids. 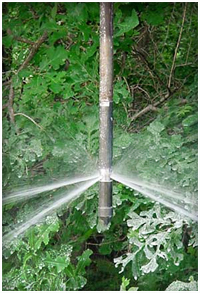 The Pressure-Activated Injection Probe allows for either top-down or bottom-up injection of remediation materials. Unlike conventional injection methods, the Pressure-Activated Injection Probe ensures accurate placement of the material into the intended injection interval. The probe also features a backflow preventer, keeping injection material “IN” the ground and not “ON” the ground. The unique internal spool design of this probe insures that the injection ports do not clog with soil.